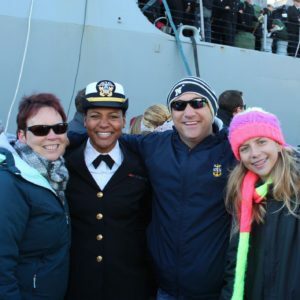 In 1988, I started on a journey in the United States Navy. I was married shortly after I joined and my wife Kelly and I have moved nine times during my career. In 2010 I was selected to Master Chief and one year later became a Command Master Chief. 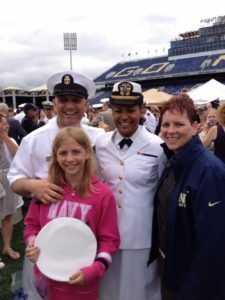 This was the pinnacle moment in my Navy career and I thought I had it all. 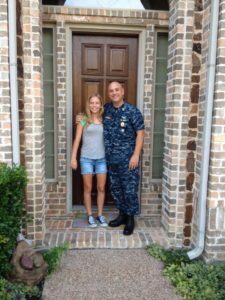 In 2013 we made our final Navy move back to Fort Worth. We began looking for a church to attend and we finally discovered Milestone about four months ago. As we visited, it was apparent that this was the church for us and I truly felt something drawing me in as soon as I entered. I then attended all three days of Prepare 2018. Each night at Prepare I felt like God was pulling me closer and I finally surrendered my life to Him. It was the true pinnacle of my life! We attended Discovery 101 and Serve Team 201 and then joined a Small Group, and now I volunteer on our Parking Team! My wife, Kelly, was instrumental in leading me to Christ. She has a very close relationship with Jesus and I have always admired that. I also have a co-worker who encouraged me to surrender my life to Jesus. It’s so clear to me now that the one thing that was missing in my life was Jesus Christ. On January 28th I decided to take my next step and I was baptized as a fully committed follower of Jesus! What a honor to baptize Devin! Devin, we are so proud of your decision to follow Jesus. God is going to use you to lead many men to faith in Christ. Best days ahead! Thank you for your service. I loved watching you get baptized in service! Definitely could tell it was a VERY meaningful moment fo you! Very happy for you and your family and love your devotion to Jesus. Devin, I’ve always been so proud of you and the career you have worked so hard to achieve. My proudest moment, though, is your choice to commit your life to God! He has done so many amazing things in my life and for my life, and I know he will do the same thing for you! We have a strong family history of faith in God and the church, and it feels amazing to know that you have chosen to continue by following God as well! I’m excited to hear the great things I know you can accomplish through Him! Love you cuz!! Congratulations! We serve an awesome God who is faithful and with him all things are possible. Fantastic. I’m so happy for you. It looks like you’re doing great. I know you’ve always done great things and many people including myself look up to you. Devin what a great day for you! The best days are yet to come as you walk In relationship with Jesus as a Christ follower. Just keep taking the steps the Lord asks you too and you will be greatly blessed. We feel about Milestone as you do. There is no better place to find spiritual family. Thanks for sharing your story . Thank you to all of your family for their service to our country! Wow! What a story. And one of the most powerful baptism moments I’ve ever seen.